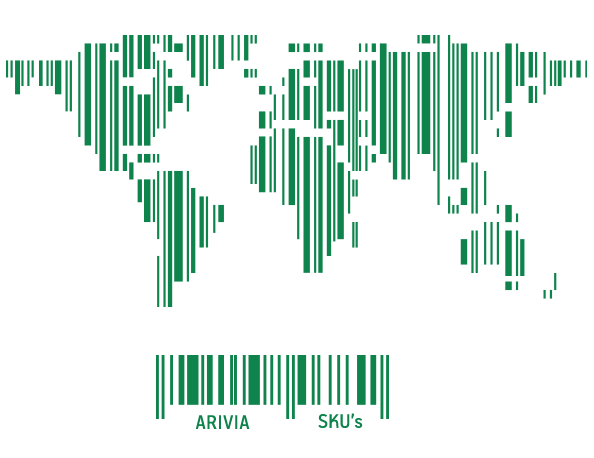 ARIVIA S.A. is a worldwide leading developer of plant-based dairy and dairy-free products, using mainly coconut oil, at an affordable price and in a variety of flavours and formats. We aim to create the finest plant based products available, while focusing on their continuous development, in order to meet, and satisfy, current and emerging needs. being the successor of the Viotros legacy, is primarily an export company. Since 1990, we have attained market penetration, through our extensive portfolio of more than 500 SKU’s, in 50 countries around the Globe with a total reach of over 100 million consumers. Since 2012 our exports have more than doubled and this number is growing day by day. with a headcount of more than 300 people, we operate a state of the art privately owned production plant in Northern Greece with a production capacity of 2,500 tons per month, one of the largest in Europe. We adhere to the strictest quality specifications before, during and after the production process and we are certified by international quality and operations certification organizations (ISO, HACCP, etc). innovative products. classic & special flavours. Our dynamic development is based on the continuous design of new products either for the end consumer with our own brands or for professionals in the international market of foodservice or the private label development. By investing in constant research and development, we continuously create innovative products that cover the dietary needs of even the most demanding consumer. We offer a wide range of products in classic and special flavours for people who are lactose intolerant or consume only 100% dairy-free products as well as for those who follow a low in cholesterol diet and due to that do not consume animal fat. Thus, consumers do not have to be deprived of the taste of cheese or meals that contain cheese. We strive to give the delight of taste to people who, for whatever reason, have been lacking of. We do so with the most planet-friendly manner. As more and more people become knowledgeable about plant-based nutrition, we expect our mission and our work to have a higher impact on people’s lives.